Huawei G730 Battery Connecter Ways Point Jumper Solution – This time we will try to discuss the solution path on the Huawei G730 battery in this troubled afternoon The damage to the battery lines often in the causes for the track is wet or disconnected without visible breakdown lane next to where. Or these tips could be to carry out checks on the mobile phone is the Huawei Huawei G730. Here are the simple steps to overcome damage to the battery or the phone lines Huawei Ascend G730. Steps that must be done is to check the battery lines as shown below, check the path carefully one by one, do not forget to also check through the resistor in the line, if something is broken, resold or corrosion. There is a path-breaking try to make jumpers carefully and thoroughly. The phone is not powering ON. Phone heats up even when power is OFF (and doesn’t turn ON also). Phone turns OFF randomly and at any point. Phone powers OFF when any specific application is accessed. The phone might be water damaged. Charging connector and/or its components might be water damaged. In this post, I have marked Huawei Ascend G730 Battery Connector ways jumpers points. If you have damaged Battery Connector prints make the jumpers as shown in the diagram below to solve your problem. 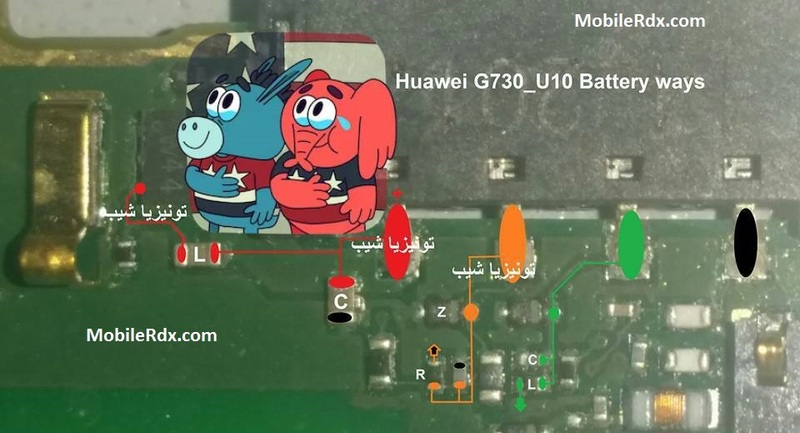 This is the pretty simple solution I have marked all positive and negative jumpers of Huawei Ascend G730 battery connector in this diagram. Before making these jumpers make sure that faulty battery connector Module is not causing this problem.